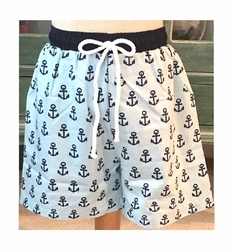 We just love this sweet light blue swimsuit, swim trunks for little boys by Sweet Dreams. 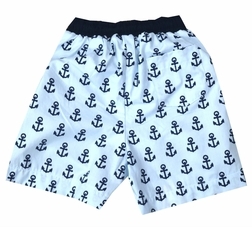 It is trimmed around the waist in navy and has navy anchors printed on the fabric. The waist is adjustable with a rope draw for better fit. The inside of the trunks have a lining.